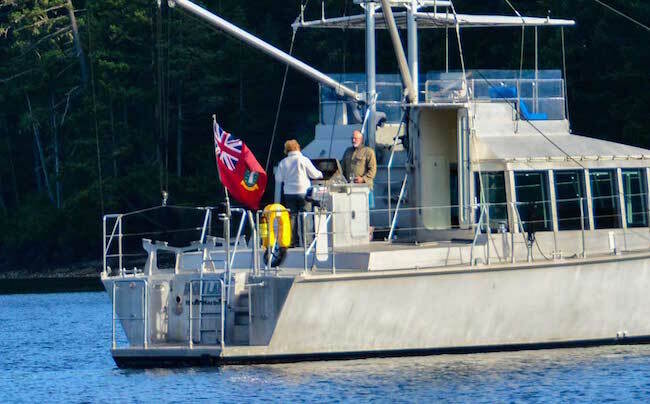 When we wrote this introduction six years ago, during the depths of a marine industry depression, we had no idea that the summer of 2016 would have 11 FPB 64s in the water cruising. For all the latest FPB 64 updates, click here. Note: speeds/ranges are for smooth water, 75,000 pound displacement, clean bottom. By the time a new design is afloat and ready for trials we have invested so much energy in it that we almost don’t want to see the outcome. But curiosity and commitment always has us on hand for trials, normally with a degree of apprehension (although we have confidence in the design methodology used, mistakes are not unknown in this business). There are four phases for us in getting to know a new design. The process starts with initial impressions. These are a comparison of what we see afloat and the 2D and 3D computer models with which we have been working. There is always an initial mental scorecard: we like some things, are not pleased with others, and are occasionally pleasantly surprised. The second phase involves detail. During the first couple of days aboard we’ll make copious observations about small details that could be fine-tuned the next time around. These are rarely noticed by builder or owner and we have learned that if we do not write them up early in the process, the information is soon lost in the overall impact of the design. The third phase takes time. We need to live with the boat for a week or two, hopefully in a cruising context, to see how the pieces fit together. Using the boat at anchor, moving her about, feeling the motion, maneuvering in tight spaces, even launching and retrieving the dinghy are part of this process. The final phase comes later. It takes a period of time away from the boat to digest all of the elements, and decide what we think of the outcome. It is these last thoughts that we want to share in this blog. We’ll start with some history and comments on the design goals. 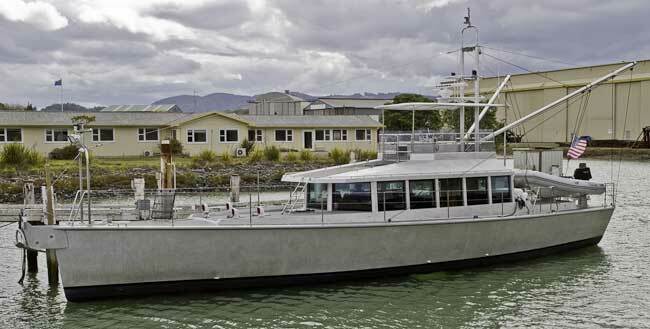 Read a July 2013 update on first seven FPB 64s out there doing it. Structural integrity with high factors of safety. Balanced lines and large rudders for heavy weather control. Design tradeoffs oriented toward maximum comfort at sea. The ability to maintain high average passage speeds. Efficient systems optimized for use at anchor away from the shore power grid, and not generator dependent. 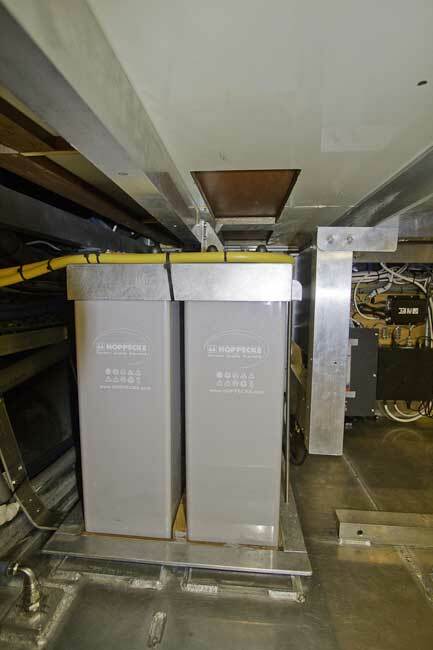 Good access to systems for inspection and maintenance. 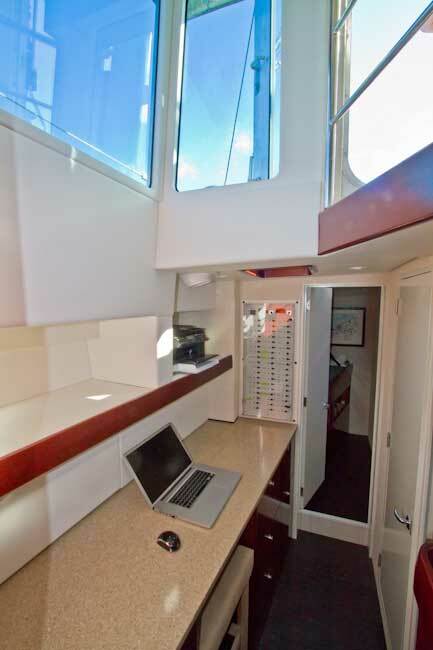 Interior layout optimized for comfort and security at sea. Minimum draft commensurate with performance goals. In addition, with the FPBs we want something rare in motor vessels (but common under sail), a stability curve that allows for recovery from a capsize, without which we would not consider crossing an ocean. 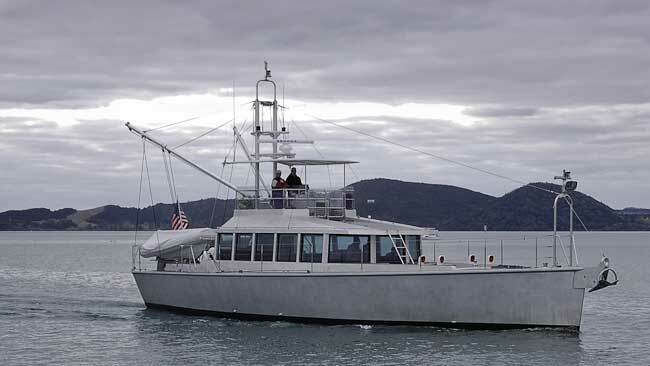 Visitors to the FPB 64 will look at the design and think, “This is a little sister to the FPB 83” (Wind Horse in Greenland’s Disco Bay is above). True, they do share a common heritage, and what we learned from all those thousands of miles aboard Wind Horse form a basis for the FPB 64, but this new design is very much its own configuration. With 5.5m/18 feet less waterline, we are asking the FPB 64 to efficiently carry comparable payload, for similar range, while delivering most of the positive attributes we have come to love with the FPB 83. This is not an easy prescription to fill. Toughest structure with highest factors of safety we have ever used. Three full and two partial watertight bulkheads. Double bottom formed by fuel and water tanks. Over 5,000 nautical mile range at 9.7 knots (full load, smooth water) confirmed with real world testing. 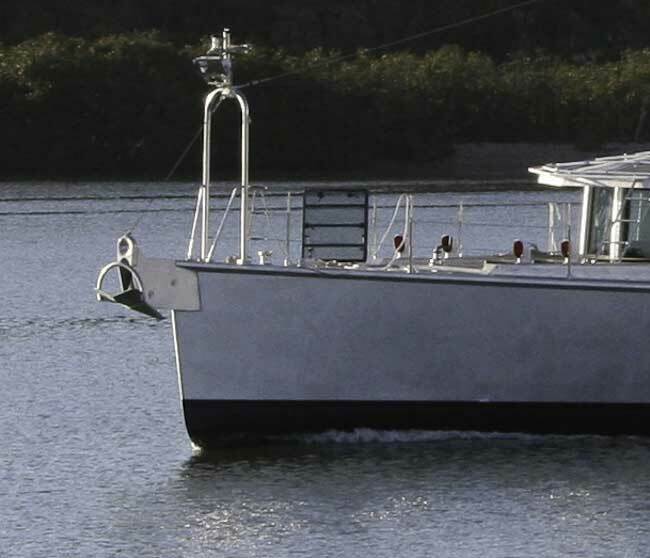 Excellent maneuverability without using the bow thruster. Aft deck layout works better than expected and barbecue, in lee of house, is a great add. Flying bridge ergonomics are excellent. New awning and frame system works well. Interior layout, starting with entry landing is on target. The feeling of spaciousness is as expected. Galley, ship’s office, and owner’s suite all work as envisioned. Engine room layout allows good access and is visually appealing. Systems installation is first rate. 11 knots top speed at full load from 236 HP confirms efficiency. It is going to be great cruising with less than five feet of draft. From here on out we are going to review specifics, most of which are covered in greater detail on SetSail posts. Click here for details on FPB 64-2 Sarah Sarah. And here for Iron Lady & Osprey details. The design process starts with a target displacement and center of gravity for the boat in cruising trim. A preliminary set of lines is drawn to float this displacement, and then we begin to look at variations in hull shape. Some designs are sensitive to weight, others are less so. Not too far into the design cycle we realized we had a configuration that could tolerate substantial weight in the hull plate and framing, if we wanted higher factors of safety. At the same time, there was a generous helping of fuel, water, personal gear left over. The FPB Series are engineered to the Lloyds Special Service Rule (SSR), a very conservative scantlings specification. This forms a baseline. Wind Horse, the FPB 83, is framed and plated to effectively twice the SSR rule stiffness requirements. It might appear that just making the structure stronger, and heavier, is all to the good in terms of safety. But excess weight in the wrong places will compromise stability, and sometimes lead to a slower cruising speed in adverse weather. Indiscriminately throwing weight at structure is never a good idea. But if weight is in the right places, and you can tolerate it and still achieve the performance objectives in terms of cruising speed and stability, then it can be worthwhile. The bottom and topside plating for the FPB 64 are 12 mm/15/32″ and 8mm/5/16″ respectively. These are multiples of the SSR rule stiffness requirement, substantially more than anything the sea will call for. But aground on a reef, working in ice, or impacting a shipping container, the extra factor of safety is going to come in handy. 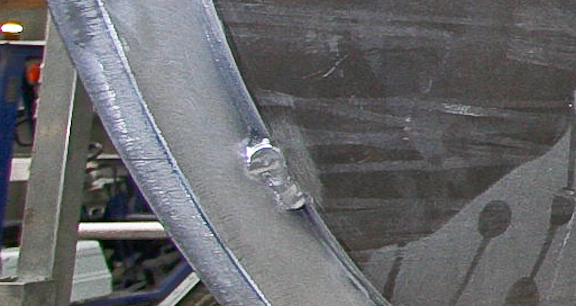 The cutwater, shown above, is a massive 40mm/1.6″ thick (shown above with the 12mm bottom plate tack welded in place). Aft end of forepeak/forward end accommodations full watertight bulkhead. Forward end great room partial watertight (to 200mm above the full load waterline (40,000 kg/88,000 lbs.). Aft end great room partial watertight bulkhead as forward. Engine room full watertight bulkhead. Forward water tanks to within 350mm/14″ of full load waterline. Center fuel tank top 50mm/2″ above full load waterline. Aft water tanks 350mm/14″ below full load waterline. Practically speaking this combination of over-specified structure, watertight bulkheads, and double bottom may never be tested. But the fact that you know it is there gives great emotional comfort, as long as you are not paying a major penalty elsewhere. Fuel and water – 11,600 kg/25,600 lbs. Spares, tools, ground tackle, personal gear – 3,600 kg/8,000 lbs. Evaluation of how the design meets its goals has to be done in the context of a fully loaded condition, with the factors of safety inherent in the scantlings described above. For recent real world data during four contentious passages, click here. 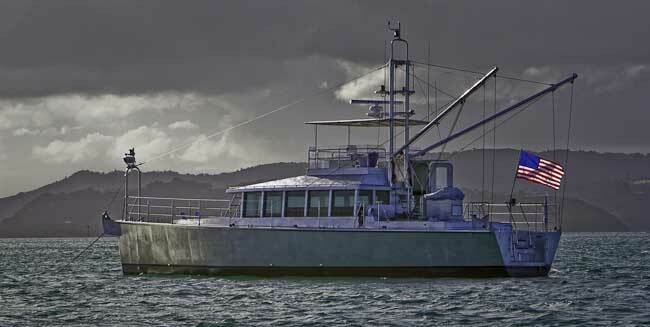 At 8.6 knots we are burning 11.8L/3.12 gallons an hour which gives smooth water range of over 9,000 nautical miles. At 9.7 knots fuel burn is 18.9L/5.0 gallons per hour with a range of 5,700 miles. Top speed at full load is 11 knots, not bad from a 236 HP engine. So, we’ve got the ability to carry lots of payload, quickly and efficiently, with extra factors of safety discussed in the preceding section. We think this makes an excellent foundation for the rest of our evaluation. Having several years’ worth of cruising capability means that disruptions in the fuel supply chain does not impact your plans. You are able to pick and choose between sources of fuel, waiting for the best price and quality. If you don’t need or want this much fuel aboard, the weight can be made up with fresh water (or you can cruise lighter). This interior includes a number of difficult design decisions and tradeoffs, and was the subject of much computer and real world modeling. Seeing the boat under construction, where the view out from the windows is blocked, with the interior space in a state of visual chaos, makes it difficult to get a feeling for how the final product will look once launched. Of course we have a pretty good idea based on experience. Still, it is a relief to see the interior completed. 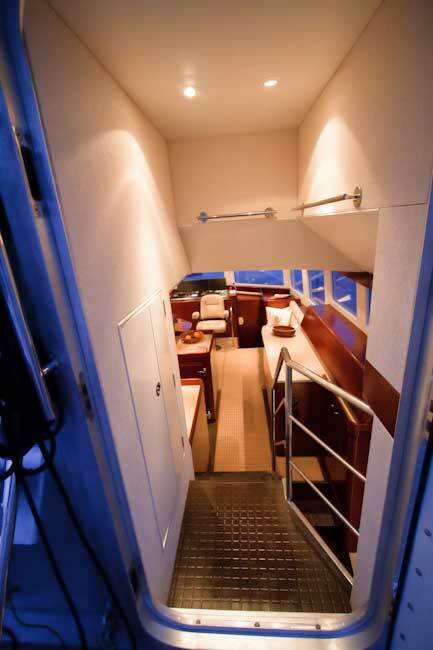 We and Circa wrestled with the entry landing area and access to the aft end of the accommodations. This was mocked up and changed in situ three times. In particular, the landing handrail system, about which we obsessed, is not an aesthetic problem, yet provides excellent security. The effort was worth it. 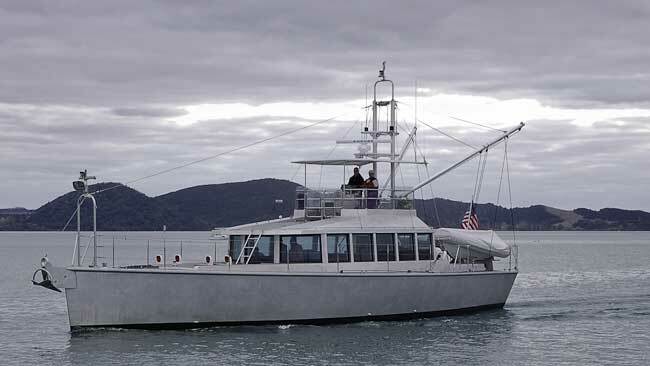 For recent interior shots on FPB 64-6 Grey Wolf, click here. Recent galley option details and other specifics are here. The space flows, has an open but protected feel, and invites you into the great room. The division of the great room space between galley and salon/bridge area was the subject of much debate within our office and with clients. On paper, the galley looks enormous, almost out of proportion. But it, and the salon area, work well together. This is the best galley we have done yet, with wonderful storage, lots of counter space, and substantial fridge and freezer capacity. 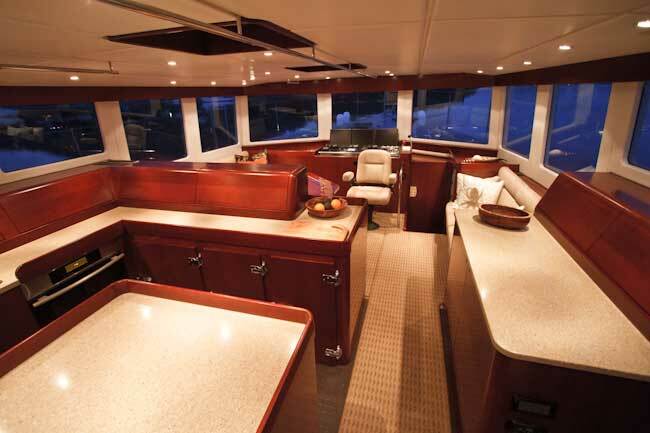 Check out interior details on FPB 64-5 Tiger. At the same time, the space devoted to the salon, while a touch smaller than the galley, is just right aesthetically and very functional. The settee to port is comfortable for sleeping and the shorter seat to starboard works for watchstanding and reading a book with your feet up. 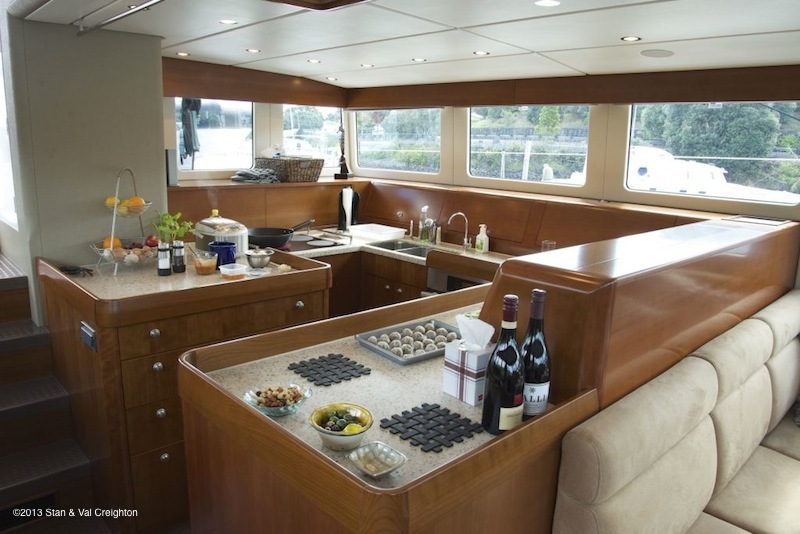 During sea trials we asked the first four sets of owners what they thought of the distribution of space in the great room, and would they trade galley space for a larger salon. The uniform answer was “No”. 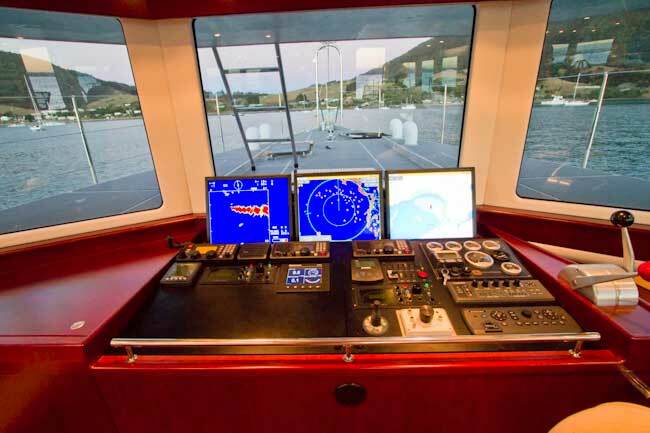 The bridge area ergonomics have come out well, with good sight lines, easily read instrumentation, and key controls within reach when seated in the helm chair. You can get feel in the photo above for how this works underway. 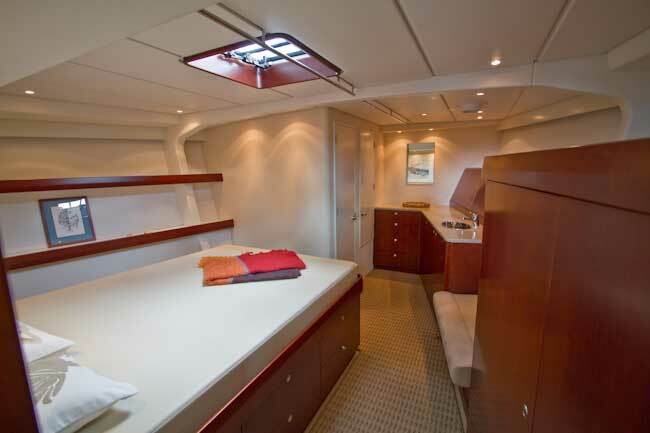 The forward owner’s suite has a familiar layout to it if you have seen our yachts before. The interior beam and starboard side length, when combined with artwork on the bulkheads, gives it an ambiance, and a feeling of spaciousness that is just wonderful. 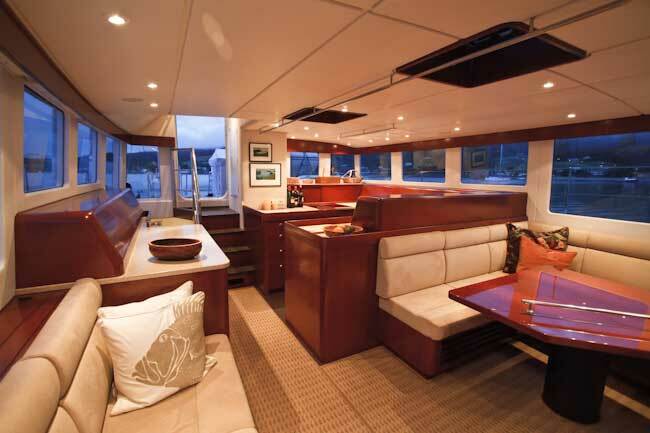 The couch midway on the starboard side, while costing storage space, is a worthwhile visual and functional element. One of the design targets from the beginning for the FPB 64 was a large ship’s office. The entry to this area, with the cathedral ceiling and large windows above, is magical and the natural light a boon. Having spent three days aboard using the office daily, we can attest to its efficacy. 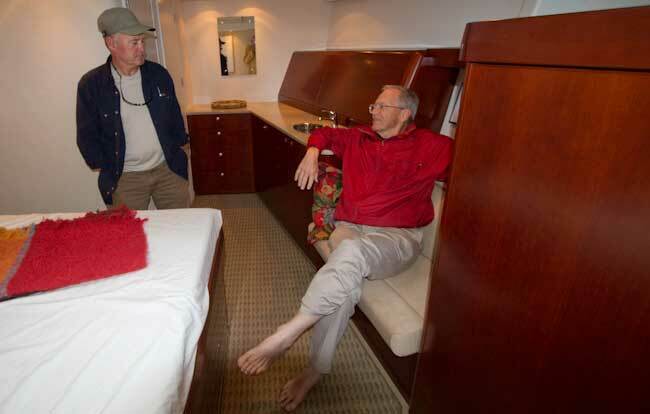 Likewise, we had a chance to test the single bunk crew cabin on the aft starboard side. We are happy to report that the bunk is actually quite adequate, as is the storage for personal items. The head works well, but then this is no surprise as we’ve used similar designs in the past. We like the interior, a lot. 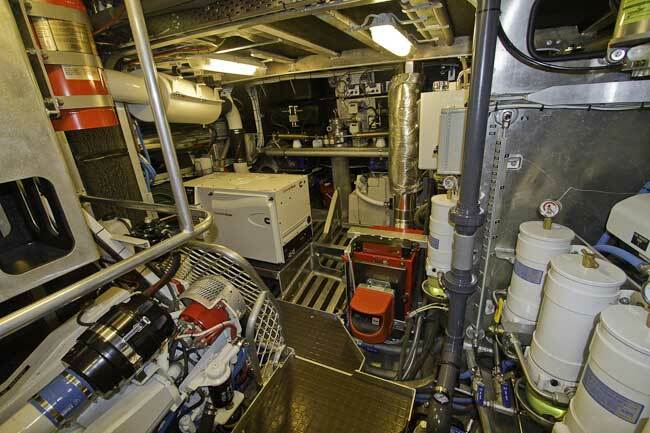 Click here to see detailed engine room interior shots on FPB 64-6 Grey Wolf. 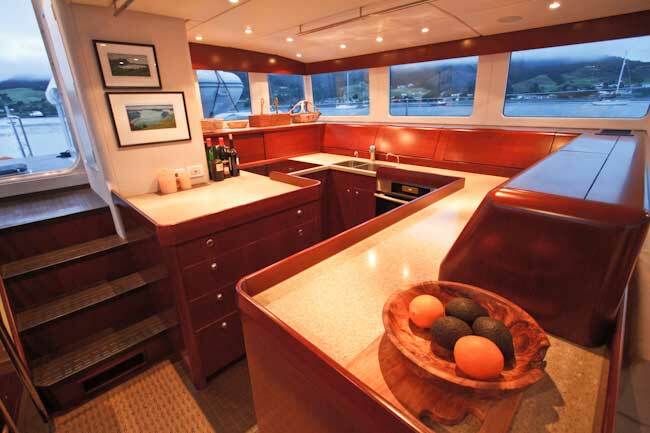 Deck design, like most things to do with yachts, has a complex set of tradeoffs. 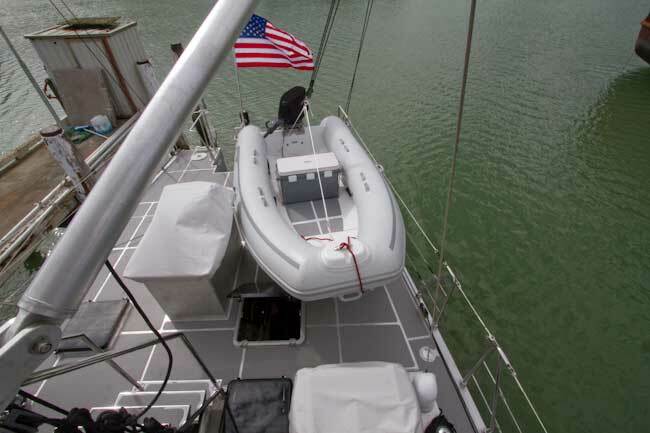 The design has to provide storage for dinghies, lounging areas, working space when docking, ground tackle and dockline handling systems, as well as many other small but important details. A key design target for the FPB 64 was a barbecue positioned in the lee of the house at anchor (the wind break provided by the house makes this much more user friendly). 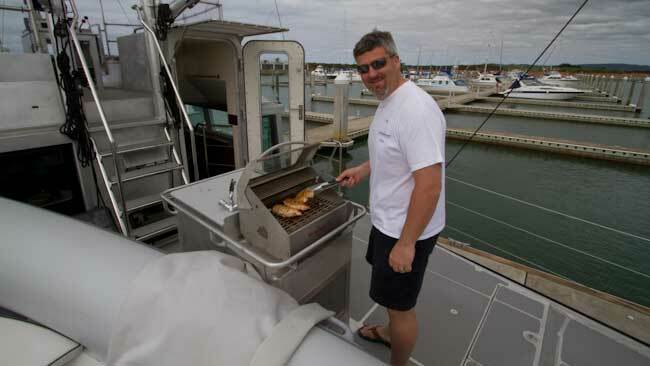 The barbecue and wash-up sink are integrated with the engine room air intake. This arrangement performs a number of functions besides the most apparent. 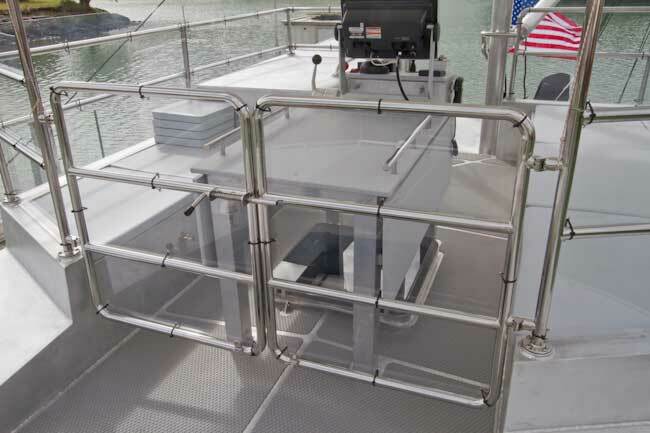 The handrail which surrounds the cabinet helps when coming down from the flying bridge, and is a safety feature when transiting aft. The cabinet also acts to stop the swing of the dinghy when bringing it aboard in a bouncy anchorage. Having seen the barbecue in action, we can attest that it works well and is definitely a worthwhile addition. We were a little worried about engine room noise escaping from the air intake. However, the insulation and baffled design trap what noise there is, and at the flying bridge you cannot tell if the engine is running. The next issue is dinghy storage. The owners of the first FPB 64 have pushed this to the max, with a 2 meter wide by 4 meter long inflatable (6.6′ x 13′). It worked in our 3D modeling, but we were frankly dubious. The owners were right – it fits well – and does not impact foot traffic. With the big inflatable in place there is room for a second rowing or sailing dink to starboard, or the lounging area we have worked up will also fit nicely. The aft power winch is well sited. In particular, the aft position makes single person launching of the dinghy practical in calm conditions. Another difficult design area was the flying bridge. This needs sufficient space for entertaining, ideally protected to a degree, with a layout conducive to taking meals at this elevated position. And you need to be able to con the boat from here. In all regards the FPB 64 flying bridge area works. In particular we like the forward entry gates, which allow easy access to the forward end of the deck. The awning pipe framework is both functional and aesthetic. A small but important detail, which will come into play later, is the inner lacing rail on the awning frame directly over the stainless steel handrails. Should a full enclosure be desired, these two parallel areas of pipework form natural attachment points. We have lived with single engine maneuverability for most of the past 30 years and not found it a problem. But Wind Horse, with its twins, opened our eyes to the advantages of even better close quarter maneuvering, and where it allows us to go. 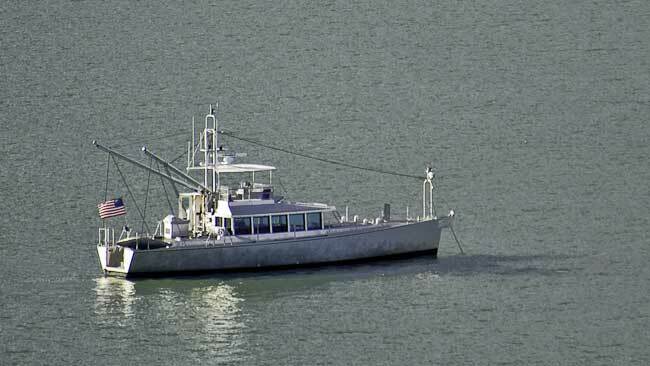 Watch video of FPB 64-7 Buffalo Nickel practicing close-hand maneuvering. So how does this work in the real world? The first question we wanted to answer is control in reverse and if the boat can be backed up. This ability, or lack thereof, has a huge impact on close quarter maneuvering options. We expected a fair amount of pull to starboard but were pleasantly surprised by an almost total lack of offset torque in reverse. 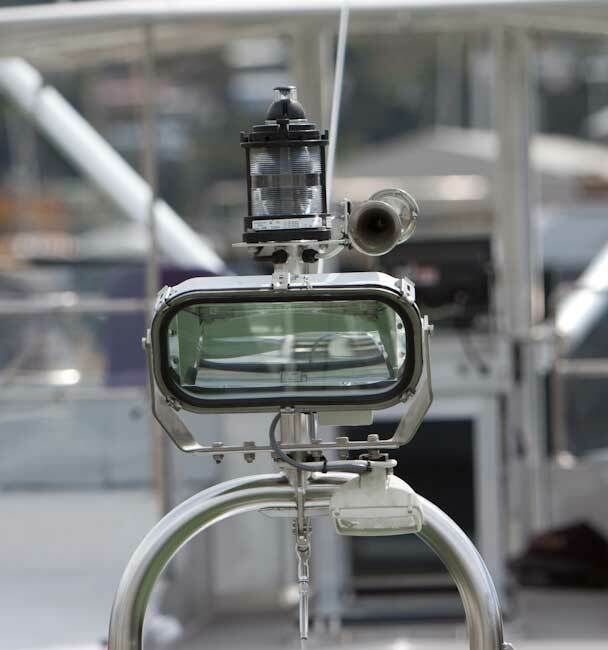 Basically, if you start reversing with the bow 15 degrees to starboard, within a couple of boat lengths you are going straight, with a degree of steering control. Backing down a long narrow channel is definitely a possibility, as long as this is done with the stern upwind. The next question is turning radius at maneuvering speed. Here we found that a generous application of forward thrust against a fully deflected rudder results in an amazingly tight turn, on the order of just over a boat length. Rotating the boat, using alternating bursts of forward and reverse can be done in either direction, but the favored turn is counterclockwise using what little stern torque there is to pull to starboard as the bow goes around to port. Fly by wire steering with fast rudder response is a great help. 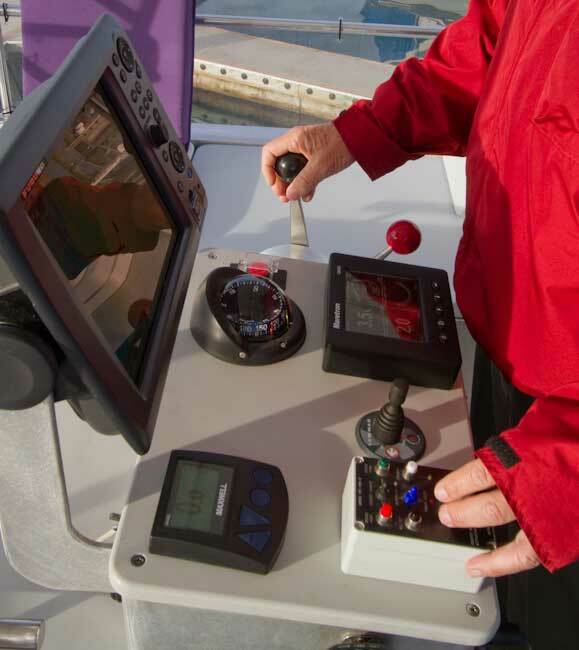 Bottom line, we are very impressed with the maneuverability, and the bow thruster will rarely be needed. Now we get to the heart of things. Comfortable motion is the key to cruising success. If you don’t pay a comfort penalty for being at sea, the boat gets used more, and the reluctance to take on long passages transitions to an eagerness to be off. While our experience with the first FPB 64 was limited, we saw enough variety of conditions to get a feel for how she is going to do crossing oceans. Let’s start with beam seas. Rolling motion is essentially nonexistent, other than what we allow by detuning the stabilizer control. With quartering or stern waves again there is little, if any, motion. In both beam and downwind states only a fraction of the stabilizer power is being used, leaving lots of capacity left over for gale force conditions. We did a considerable amount of testing without the stabilizers and found the rolling motion to be soft, without a huge amount of amplitude. Faced with an ocean crossing and a faulty stabilizer system, in most cases we would proceed rather than delay (and there are stabilizer “fish” which can be used off the booms in the event the NAIAD system has a problem). Designing for upwind comfort is a lot harder than beam or downwind conditions. With the FPB 64 and its relatively heavy (for us) displacement, we had the opportunity to develop the bow and stern hull sections in such a way as to soften the ride. We also were keen on allowing the hull to pitch a little more than Wind Horse or our sailing designs, to reduce acceleration and deceleration as waves move down the hull. The photo above of two of our owners having a discussion in the forward cabin was taken running at 9.5 knots into .9m to 1.6m / three-to-five foot waves. It wasn’t staged, they just happened to be chatting when we snapped the picture. This dialogue is taking place in the center of what we refer to as the “slamming zone” or the area of greatest wave impact uphill. We are still learning how to optimize for upwind motion. However, two things are apparent. First, keeping speed up is essential. In short steep seas of the type found along shore, the FPB 64 is happiest a t 9.5 to 9.7 knots. Longer period waves offshore may allow slower speeds. The FPB 83 Wind Horse reacts in similar fashion – she wants to be run at the top end of her cruising speed range going uphill. Second, it appears as if upwind motion will benefit from aft trim, carrying a full aft water tank, and minimum fresh water reserve forward. This moves the center of buoyancy aft directly over the center of floatation, the ideal in terms of pitching. With our type of hull shape, softening the uphill ride is not difficult. Doing it in a way that preserves good steering control at sea, in particular with the waves behind, is a lot harder. The deeper the forefoot and more V’d the section, the better the upwind ride. But deep sections forward tend to lock in the bow, and create a bow steering issue with the waves aft. This is a universal problem with trawler types, forcing them to slow down with the waves behind because of comfort and control issues. As the weather deteriorates, the lack of downwind control and risk of broaching forces them to turn around and jog into the seas. 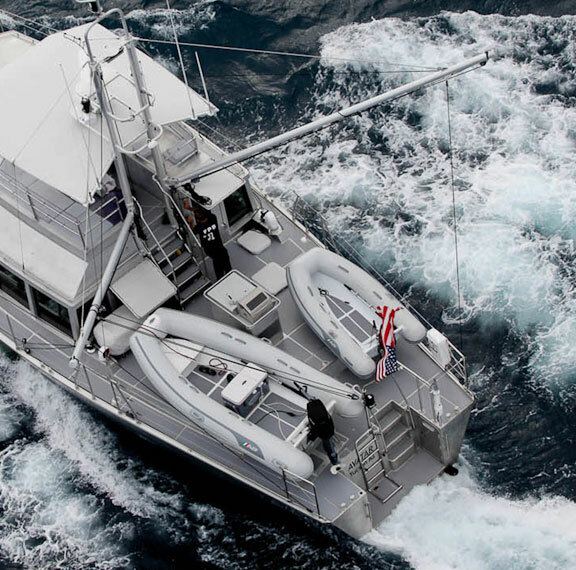 We are pleased to report that the FPB 64 exhibited no tendency to bow steer, and she needed little assistance from the autopilot to stay on course. In several instances with waves behind we turned rudder gain to zero and deadband to a maximum eleven degrees – essentially the pilot was turned off – and the FPB 64 ran like she was on rails (all of which you can see on the previously referenced video). 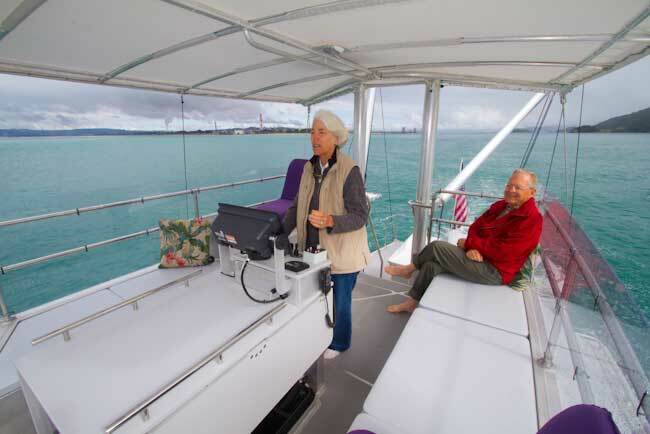 If a comfortable motion is key to going places, systems installation and the engine room are at the heart of the cost of cruising and frustrations (or lack thereof) associated with the cruising lifestyle. Insure that all systems can be easily inspected and maintained. Over-specify equipment and it will have a much longer, trouble-free life. Keep things as simple as possible while still providing for a comfortable cruising ambiance. Design systems that are optimized for efficiency at anchor, without the need to resort to constant running of the genset. The systems approach on the FPB 64 is similar to what we have been doing for decades, updated to current technology. It starts with “traction” batteries with the capacity to go for days at anchor without use of the genset. AC power is provided by the inverter bank, with an occasional assist, maybe every other day, from the genset. The majority of battery charging takes place underway with a pair of 150 amp/28 volt Electrodyne alternators with remote rectifier assemblies. 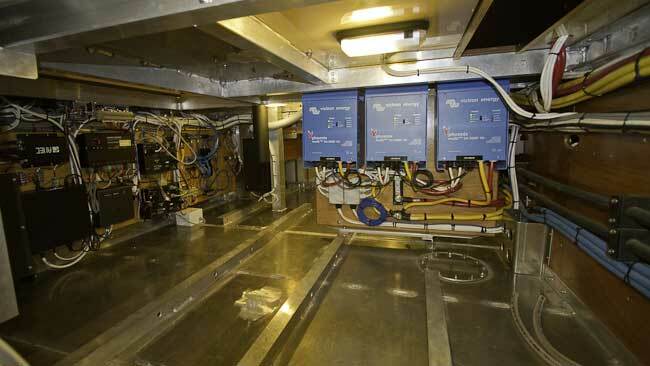 Systems reside in a large engine room, and around the perimeter of the “basement” below the great room. In both cases access is excellent. Many of the systems are normally not visible. However, as owners we like to know that the hidden details, such as those in the basement (photo above), are as nicely done as those in view. It gives us a sense of satisfaction, pride in ownership, and emotional comfort, knowing that if systems are installed with care the level of reliability is likely to be higher. Circa’s systems installation in the engine room is to the highest standard we have ever seen on a production yacht – truly a work of art. Both fore and main masts are evolved from Wind Horse. Starting with the foremast, we have gone to a double-legged stainless configuration. 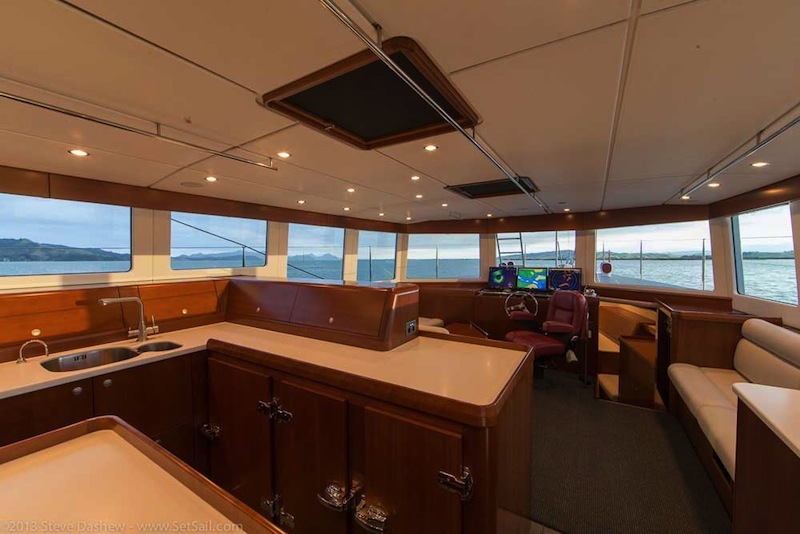 There are a variety of nav, deck, and flood lights positioned here. The “bobstay” (inverted) from the foremast down to the end of the anchor sprit is great for holding on to when working on the pointy end. The forward position of the mast makes the large floodlight more effective in spotting debris in the water (it can be aimed down without hitting the boat). The mainmast assembly is hinged for storage, maintenance, and cruising where there are vertical impediments (bridges). This feature will become much appreciated over the years. 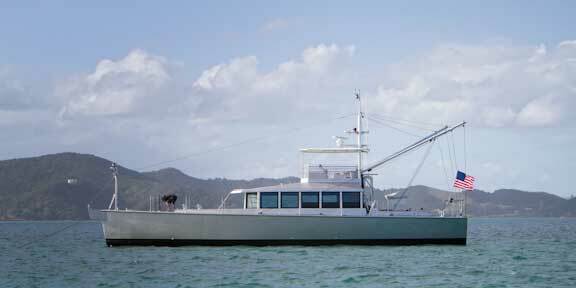 Each main mast comes with stout 6m/20 foot boom. 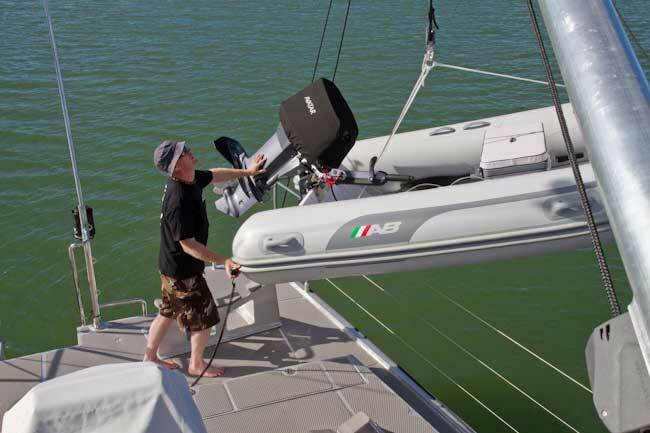 These booms simplify dinghy launching, work with roll control devices at anchor, and with the get-home sail rig. They are easy to use with permanent fore and after guys leading to rope clutches, halyards on the ends of the booms, and dinghy lifting halyards. The “headstay” between main masts and foremast provides a natural long wire antenna for SSB and amateur radio bands. The shorter foremast and longer mainmasts make this technically a schooner rig. Whatever you call it, the rig looks cool and does valuable work in a cruising context. There are many factors that go into picking length. In the case of this FPB, we could have forced the design into something in the 58 foot /17.8 meters range. 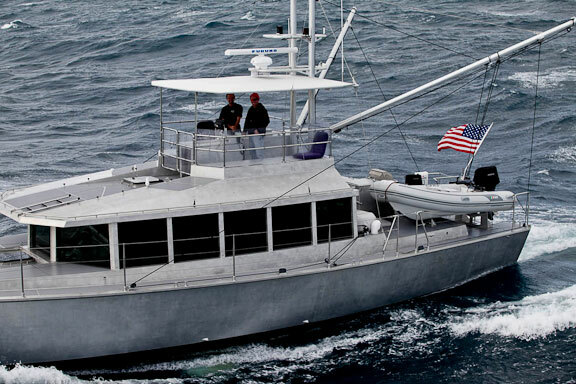 However, it is a much nicer boat at just under 65 feet/20 meters. We get better speed and range, more space for accommodations, more accessible systems, and less bulky proportions. And we avoid the regulations which start at 20 meters/65 feet. Having now seen how the FPB 64 works, we are very happy she wasn’t compressed. The marine industry tends to create yachts that look good in boat shows and marina settings, but that are not optimized for crossing oceans. This leads to beamy, tall, high-volume configurations for sail and power. If you plan on local cruising, and can stomach the appearance, this approach can be considered rational. But once the horizon beckons, the negative seakeeping impact of the proportions that create the volume has to be carefully evaluated. There are both comfort and safety issues to be considered. 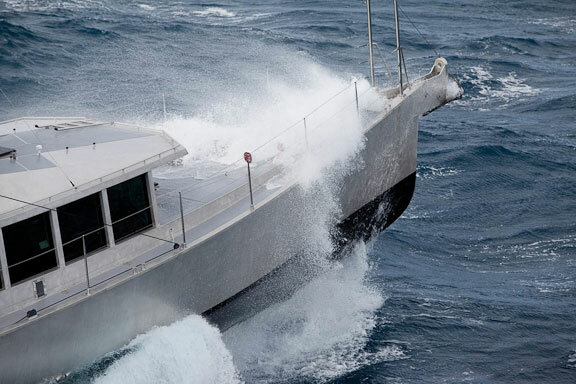 Our concept for the past 35+ years has been to design for the worst, creating a configuration which is both safe in heavy weather, and comfortable in an ocean crossing context, including when conditions are less than ideal. This leads to more miles by our owners – attested to by the multiple circumnavigations done by many of our yachts (and Wind Horse’s 45,000 miles between launching in 2005 and the fall of 2009). The lean, efficient designs to which this philosophy naturally leads also look very cool. But then, we might be considered biased. We’ve been testing a variety of options for a get-home sailing rig, and working with the owners of Avatar and their Skipper Rod Bradley, have come up with a configuration that is easier to use and more efficient than our original concept. Essentially this is a small roller-furled sail, rigged from the end of one of the booms to the forward mast. There are two tack points forward, one at the top of the foremast and the other lower, with the sheet led to the rail, and then to the coaming winch aft of the house. The rough prototype sail is about 28 square meters/300 square feet, and does a surprisingly good job at pushing the boat. Use the bow thruster to get the bow pointed downwind for comfort and to make working easier. It takes 2.5 knots of flow over the rudder to maintain steering control. The current get-home rig can sail as close as 110 degrees to the wind, depending on sea state (possibly better when we get a properly shaped sail). The key is keeping boat speed high enough so the rudder is effective. Ideal true wind angle is 140 to 150 degrees. In 18 knots of wind, Avatar sails at 3.7 knots on a broad reach. That’s 80+ miles per day. It might not be fast, but it would get you to an off-the-wind destination, even it was several thousand miles distant. Having a single roller-furled sail simplifies handling. Rigging is relatively easy and the rolled sail is compact and simple to store. Some owners may want to have a second lighter and larger sail, for lighter airs. We are continuing development and will keep you informed of progress. You may have guessed that we like the FPB 64. At its price point it is, without a doubt, the best cruising yacht with which we have ever been associated. All the elements that go into designing and building a yacht like this work efficiently together. The boat speed, fuel burn, range, layout, motion, maneuverability, and systems create a whole which is greater than the sum of its parts. We are used to hitting our targets, but the FPB 64 is on another plane. A final thought. This project has been very much a group effort. 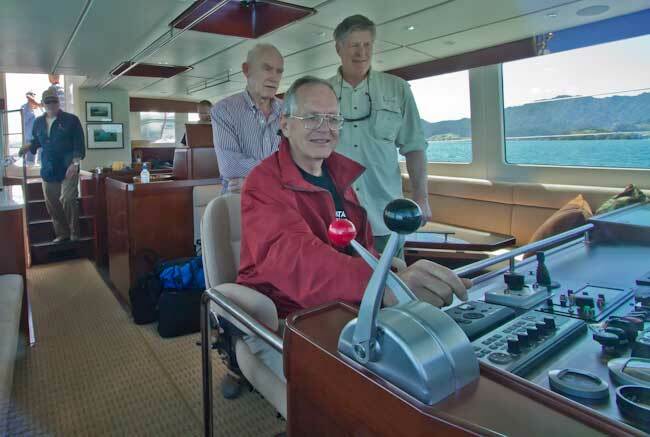 From Bruce Farrand and his team at Circa Marine, to Kelly Archer, the many suppliers, our owners, and project managers, it would not have turned out as well without extreme effort on everyone’s part. Want to learn more? Contact Sue Grant: Sue.Grant@Berthon.Co.UK for full details on the FPB 64 program. This entry was posted on Friday, May 8th, 2015 at 1:12 pm and is filed under Dashew Offshore, Favorites, FPB 64 Updates, two. Both comments and pings are currently closed. How can we see this boat. How long it. Takes to deliver after order. I love what you have done here. I do have a question and I don’t know if its even practical. I’ve been seeing electric A/C motors such as Elco being implimented into some sailboats. Now its not practable as a primary engine, but as a secondary, given the large battery banks and solar array’s and given their 0 maintainance is this even a practical idea? Mike: If you do a search on SetSail you will find lots of commentary on electric propulsion. Bottom line, it is not ready for out type of application. The helm station is located in the salon-how do you maintain light discipline at night? Our experience with Wind Horse was light pollution was not a problem offshore. We had low level lighting for the galley which did not interfere with our ability to see a properly lit ship or yacht. In traffic, or close to shore, if we were using the inside helm, we’d keep the rest of the area dark. 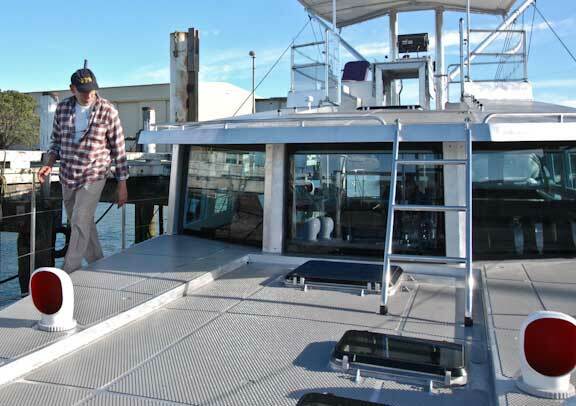 With the new boat any piloting or operation in traffic, will most probably take place from the Matrix deck. 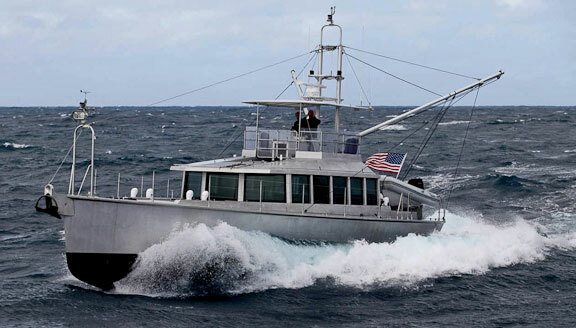 Interesting design,but what about the solidity of those windows in case of a breaking wave?is there one of these boats in California that I could see? The windows are far stronger than the Lloyd’s rule requirements. Our concern is not a breaking wave, but more about the loads of a rollover, for which there are no window specific scantlings. Hence the use of 19mmm/3/4″ glass! At wat predicted windspeed do you recommend the awning over the flybridge to be taken down while on passage ? We assume the Stamoid roof and windows are always in place except possibly when hauled out for long term storage. As a point of reference Wind Horse did a hurricane test for us last year in Beaufort, NC (USA). I have been following your work for many years now, since you started publishing the early stages of the design cycle for the FPB-64. I followed Avatar come to life via your blog. This was back when our liveaboard cruise was just a distant dream. And since then, your blog and books have been a key source of information as we developed our dream into a plan. Fast forward to the present, I have just started our long-dreamed cruise with my family. And right on the first day, literally at the first hour, when we stopped at the fuel dock to fill up the tanks and depart Seattle for good, there she was – Avatar, just a few feet away. What a boat. Congratulations for designing and building such a great vessel! Thanks Alex, and good luck with your cruising!